Keep children safe with the Super gate Ergo. Gate safely contains children and pets in a variety of settings. Designed with this in mind, the North States Super gate Ergo provides secure, effective protection that is ideal for families with multi-story houses. This versatile gate is a beautiful neutral sand color, perfect for any home decor. It is designed to securely barricade doorways, stairways, and other hard-to-block spaces. This gate offer 5 mounting options for versatility. Right out of the box, the Super gate Ergo can be used as a quick and easy pressure mount gate no measuring, hardware, or tools required. Simply expand the gate in the opening and lock the handle. Well-suited to blocking doorways, the gate includes proprietary door sockets that provide extra holding power for pressure mounting it in openings between 26" and 42" wide. Also perfect for barricading hard-to-block spaces, the gate includes rail sockets that let you mount it between two railings or between a railing and a wall. The gate can also be used as a hardware-mounted swing gate, perfect for highly used areas such as the kitchen and living room. With the gate's smooth, rounded edges, opening and closing it is quick, easy, and pinch-free. Finally, unlike some other gates on the market, the Super gate Ergo is certified for mounting at the top of a stairway and includes the necessary hardware to do so. Keep your child safe and secure with the Ergo. Designed with this in mind, this versatile safety gate is designed to securely block doorways, stairways, and other spaces. 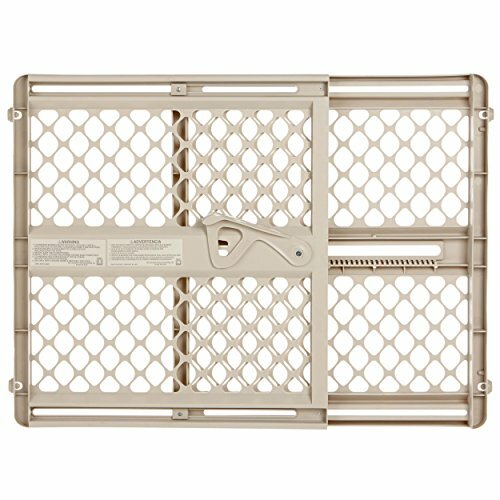 Right out of the box, this baby gate can be used as a quick and easy pressure mount child gate, requiring no measuring or tools. Simply expand the gate in the opening and lock the handle. Well-suited to blocking doorways, the safety gate includes door sockets that provide extra holding power for pressure mounting in openings between 26" and 42" wide. This child gate can also be used as a swing gate or a gate for the top of a stairway, all of the necessary hardware is included.